This lagoon city has been a big challenge for our model builders. It wasn't easy to capture the romance of the little alleyways and the hustle and bustle of the public places, the special beauty of decay and even the sunset over the city and to make all of it tangible. Not to speak about the tourists, the multitude of culture and the Venetian carnival. 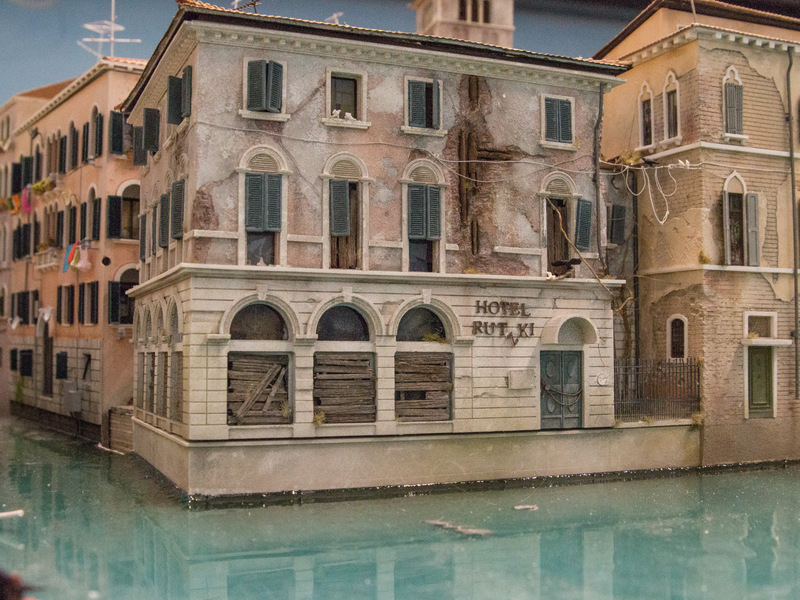 For all of this we rebuilt many of the famous buildings like the Rialto Bridge, the Procuratie and St. Marc's Basilica as elaborate miniature models, we set thousands of small figurines and sent hundreds of gondoliers on their journey through Venice's canals. Even the street-lights have been made individually and by hand. And it is not only the tourists enlivening the alleyways of this cultural heritage, if you look closely you will find many scenes taken from history and from movies and some pieces of art taken from the Biennale. Apart from these famous sights the Venice in Wunderland has a lot more to offer. It was important to us, to not just depict the Venice of tourists, but enable insight into the real Venetian life and the charm of northern Italians. We recommend taking a closer look into al-leyways and backyards to get the idea. With its 9 m2 this section is rather small regarding Wunderland standards – but despite its size it holds other superlatives. Never before have we built with such devotion to detail and such complexity. It cost us roughly 1 million Euros and 35 000 working hours over the course of a year to create and model this –so far smallest- section of the Wunderland. It was a real challenge to imitate the degeneration of the buildings, naturally caused by Aqua Alta, in a realistic way, but our Wunderland architects managed just fine. The elaborate ornaments on the faces of the buildings were also a major reason for the high budget in time and costs. We hope you will soon stop by to get your own impression and of course we hope you will like Venice just as much as we do.